Once released, you can turn the handle to either open or close the garage. Once finished, you can lock the handle again to hold its position. It comes in a silver finish and suits Starfleet, Capital and Bonsack doors. Hi, guys. My name is Darrel and I'm head of the tech team here at LocksOnline. Thanks for taking some time to tune in and have a quick look at one of our product review videos. Now I'm putting these short little videos together to be able to give you, our customers, the opportunity to see the products that we have to offer in a little bit more detail, and in the flesh, so to speak, and hopefully help you make a bit more of an informed decision. Today we have a garage door handle that's available on our website, manufactured by the company Birtley. Also will work on garage doors Starfleet, Capital, and Bonsack as well, just in case you have those different type of garage doors. 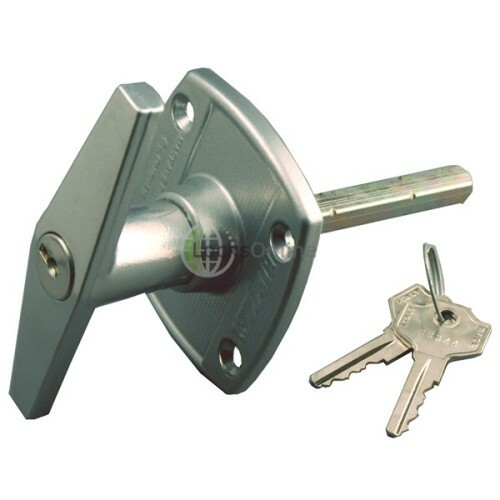 Now this particular handle here has the standard T handle that are quite common in the U.K. and obviously it can rotate then 90 degrees to that particular position. 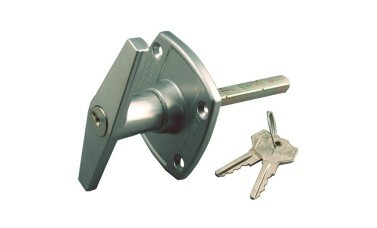 The keys will allow it to lock in either the horizontal or the vertical depending on your application. On the back of the actual handle as well you can see here we've got a length of the bolt or the spindle that comes out the back, etc., and that sits at a square position, not a diamond but actually you have a square position like that. It comes with a set of screw fixings as well that will allow you to screw through here into the metal. It comes with a nylock and a washer as well which are obviously designed to screw into the metal on the garage door itself. Also, once you've actually go the mechanism on the back here it also comes as standard with a split pin there allowing you then to fix the bracket on the back then back together. Now for a couple of measurements you're looking at your fixing centres there of 39 millimetres. Those are those fixing centres there, so if you're thinking of replacing this, then that's quite an important measurement. The overall length of the bar or the projection, that's from the face plate to the very end there is 82 millimetres. The width of the bar itself there is about 7 or 8 millimetres. That's the actual thickness of the spindle itself. The actual backplate of the actual lock itself there is about 70 millimetres and its height there is slightly less at round about 65 millimetres. The size of the actual handle itself from one end to the other there is about 100 millimetres. So there you go, guys. Just one of the products that we have on our website. It comes as standard with two keys if I haven't already mentioned. But if you need a bit more information or you want a bit more advice, by all means, pop online, use the live chat that we have, pop us over an email, or simply do it the old-fashioned way and pick up the phone and give us a call. Either way, we'd love to hear from you, and more importantly, we'd love to see you as one of our customers. So from me, Darrel, and all of us at the team . . .